■ Side door trims are designed to prevent "car park" damage to the bodywork where some people open their doors and damage the paintwork. ■ In addition to the practical aspect of these side body trims, they do add more style to Mercedes Benz Vito 2017. ■ Side door trims fit the existing trims and molds perfectly with adhesive tape. No cutting, drilling or tool work are needed. Step4: please install the products in the right place. Don't wash your car within 48 hours. 1. 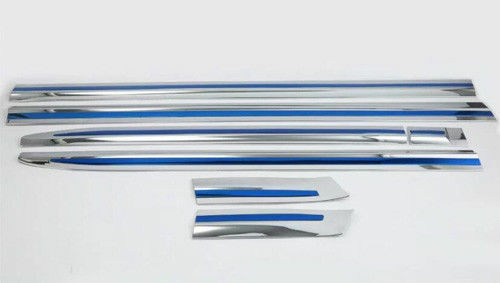 Our main product line of SUV decoration accessories: front grill, head/tail light cover, fog light cover, mirror cover, door handle cover/ handle bowl, door sill, side door streamer, rear trunk streamer, running board, rear bumper protector and chrome decoration parts, etc. 3. Rapidly update lastest car models and products and rapidly reply your inquiry. goods, test them, and give me a feedback. If you have any questions about the problem, contact with us, we will offer the solve way for you. 6. Welcome to our company for visiting. 7. Welcome bulk purchase, we will offer the favorable price to dealers over the world. Over the past few years of production and management and exploration, Lanteng set up its own quality management system. Passed the ISO9001: 2000 quality system certification and ISO14000 environmental management certification system. LanTeng always implement the concept of customer value creation for customers tailored products to meet the needs of different customers, and continuously provide customers with solutions and technical problems. Further exploration and innovation, and excellence.